“I had no idea that the music would as iconic as it has now become but I definitely felt that the music was just good music and I was motivated. “The first [song] I recorded with them was Everybody Dance. I felt like this is going to be something really special, people are going to like it. But [I] had no idea 40 years later this music would be going so strong”. Everybody Dance went on to be a big hit for the band in the United States, topping the Billboard's Dance Club Songs chart in 1977, peaking at number 38 on the Billboard’s Hot 100 chart and number 12 on the Billboard’s Hot R&B/Hip-Hop Songs. But in 1978, Wright decided to leave Chic to pursue a solo career, releasing her debut album Norma Jean in July of that year. The single Saturday was her first solo hit, reaching 15 on the US R&B Top 20 charts. Later, the non-album single High Society reached 19 in the US R&B Top 20 charts in January 1980, solidifying Wright as a solo artist. Her recognition as a solo disco artist and her relationship with Chic has since earnt her the title as the “Queen of Disco”. A title she is humbly surprised by. “Oh my! I would say there are several of us, I share that title with… of course Donna Summer and Gloria [Gaynor] and Martha Wash… so many others… but I am honoured if I am on that list. Totally honoured”. The genre of Disco was massive in the late 70’s and 80’s and a culture that according to Wright was “all races … the LGBT community, it was nothing about division”. At the end of the 70’s, there was a huge anti-Disco reaction, which Wright thinks was brought on by “… the establishment [feeling] threatened by the camaraderie … and [that] this music was bringing people together in a way [that] hadn’t been done”. Despite all this, Disco music is still relevant today and has had a strong influence on today’s music, in particular birthing the genre of House music in the late 80’s and 90’s. In a new wave of music, early House DJ’s were taking Disco tracks and remixing them for a modern, at the time, audience. Wright, of course, was one such Disco artist whose music was re-worked and given new life through the genre of House music. “I think it’s wonderful … it [allowed] a younger audience to hear the music and to appreciate a lot of our old catalogue”. Her hit track Saturday was remixed by Turkish-born DJ Dimitri from Paris in 2010 and she is such a fan of the track, this is the version of the song, she will be performing when Wright comes to the Sydney Opera House in October as a part of the Disco Spectacular show. 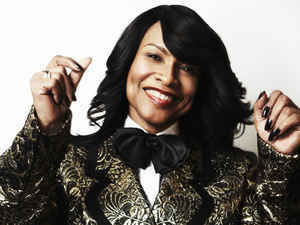 Disco Spectacular will see Wright joined by Cynthia Johnson (of Funkytown fame), Ultra Nate, Kym Mazelle, Denise Pearson and Pauline Henry, all perform their popular Disco tracks with a 45-Piece Symphony Orchestra. It is the only show in Australia and shouldn’t be missed. It’s Wright’s first time in Australia and she is excited to be performing. “Bring your dancing shoes,” she says. “I’m going to be doing some of the classics from Chic … and the show will cover a lot of hits from the Disco era. “It’s just going to be a fun-filled night and people can come and have a great time and enjoy themselves." Disco Spectacular: The Greatest Hits of Disco will be at the Sydney Opera House on Saturday 6th October. Tickets are still available. With over 50 years in the music industry, there is no stopping Wright, she is still recording and releasing music (new music will be out soon), touring, performing and dancing in the true Disco style.